Back in May 2014 HEXUS covered the news of Sandisk's launch of its Optimus MAX Serial Attached SCSI (SAS) solid state drive (SSD) with a capacity of 4TB. This is an enterprise focussed drive, sold at a breakthrough price point. At that time a SanDisk marketing executive told ComputerWorld that this 4TB drive was "just the beginning" and we should expect to see a doubling of capacity every year or two. Well it's turned out that it won't be a year, it will be two. Tech site KitGuru reports that the original 4TB Optimus MAX drive is still being qualified for use by various OEMs and it won't be until later this year that SanDisk starts to ship these drives in large volumes. 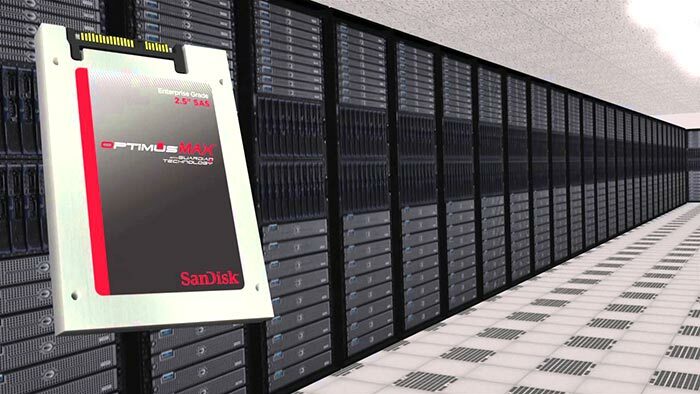 Enterprises can move slowly in adopting new tech, but in a recent investor conference call Sanjay Mehrotra, chief executive officer and president of SanDisk, said that "The Optimus Max SSD has become an important high capacity solution for one of our OEM customer’s all flash array offerings". Mehrotra went on to note that "Several other OEM and hyperscale customers are now qualifying our 4TB enterprise SAS SSDs". Larger capacity Optimus MAX SSDs will emerge next year, according to the SanDisk CEO. "We are developing our next-generation 15nm NAND flash-based 12Gb/s SAS SSD with higher capacity and performance," said Mehrotra to investors. "We expect to introduce that solution to market in 2016 with revenue contribution starting in late 2016." These slightly delayed, up to double capacity, SSDs will make use of Toshiba multi-level cell (MLC) NAND flash memory fabricated at 15nm. Later, SanDisk is expected to double up capacity again thanks to 3D stacked BiCS NAND, bringing along an even better price per GB ratio and perkier performance. So according to that chart, storage SSDs were far more expensive than server SSDs? Ok, I know they just ****ed up the legend, but still, would make you not really want to trust the company who put that together with anything that requires attention to detail…. Till gonna wait ‘till SSD Cost/GB is no more than double that of conventional HDD’s. So basically when SSD's have capacities about 4X what they are now for the same price I'll grab one, until then I'll stick to Raided HDD's and Ramdrives. so by 2019/2020 SSD will be costing lesser than HDD ?! That point will probably happen but I'm not sure it'll be 2020, although it might be - currently at the 1TB level, just quickly I can find SSDs as low as 27p per GB, hard drives as low as 3.6p. Considering the uplift in performance SSDs already offer more for your money in every way apart from raw capacity IMHO. I prefer Samsung's approach of longer (more reliable) nodes and 3D stacking. We seem to have entered the realm of diminishing returns with the node shrinking strategy.